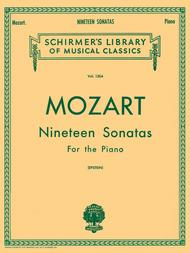 19 Sonatas For The Piano (Piano Solo). Composed by Wolfgang Amadeus Mozart (1756-1791). Edited by Richard Epstein. For Piano. Piano Collection. Classical Period. SMP Level 10 (Advanced). Collection. Fingerings, introductory text and thematic index (does not include words to the songs). 314 pages. G. Schirmer #LB1304. Published by G. Schirmer (HL.50258580).ISBN 0793526019. With fingerings, introductory text and thematic index (does not include words to the songs). Classical Period. 9x12 inches.Revised and edited by Richard Epstein with a biographical sketch of the composer by Philip Hale. All text is written both in English and Spanish.This title has selections that range in difficulty from SMP Level 6-10.About SMP Level 10 (Advanced)Very advanced level, very difficult note reading, frequent time signature changes, virtuosic level technical facility needed.